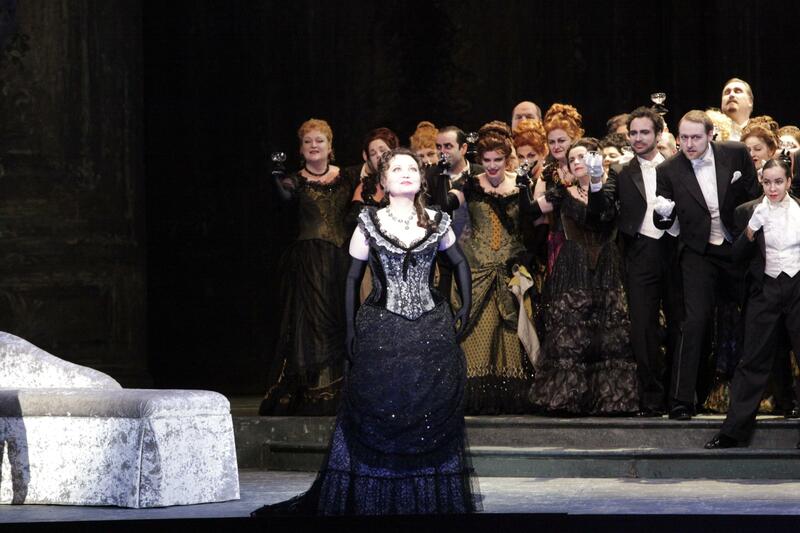 As a card-carrying member of opera’s Old Chestnuts (big thanks here to my late father, who made me invariably think of them as that), Giuseppe Verdi’s La Traviata has many reasons for being produced worldwide, year after year, and indeed century after century. For starters, it’s one of the art form’s rare stories that everybody can believe and invest in. Though set in glittering Paris of the 1800s, it portrays elements of romantic love that most have experienced in their own lives. According to opera history, Verdi himself was experiencing a similar story just as he was setting Alexandre Dumas’ La Dame aux Camelias to his own brand of stirring, passionate, lyrical music. Maybe it helped. For another thing, La Traviata’s front-and-center role of courtesan Violetta Valery has a wonderful way of creating divas, the kind based on art instead of attitude. That, more or less, is what happened last night at Houston Grand Opera’s moving (if intellectually strained) production. In that age-old showbiz tradition, Russian-born soprano Albina Shagimuratova walked onto the Wortham Center stage as a singing actress, and left it close to three hours later as a star. All members of the cast received enthusiastic applause, especially since many understood that tenor Bryan Hymel had been called in to take over the male lead something like three days earlier. But that unique Texas blend of classy “Brava!” and hootin’ and hollerin’ was reserved for Shagimuratova, who has been embraced as “local artist” since her days with HGO Studio. Despite barriers thrown up by British director Daniel Slater, last seen here with Lohengrin in 2009, this Violetta was everything one should be, both dramatically and vocally. She seemed alternately filled with bravado and vulnerability, a woman who seems to know she’s dying more than in some productions but who reacts to this and rages against it with heartbreaking intensity. For once given coloratura fireworks that paint character rather than simply show off singing, Shagimuratova displayed an almost-breakable wonder in each and every note. Her Act I anthem, “Sempre libera,” was a showstopper. And by the end, as Violetta breathes her last in the odd manner Slater devised, no one watching could doubt she truly loved this young man Alfredo, that she made the sacrifice she makes for him out of love, and that she prays God will thank her with the forgiveness she seeks with a checked past but a pure, penitent heart. Now, about Slater’s direction… It’s starts out cinematic and logical enough, using the brittle sighs of Verdi’s overture (brilliantly drawn out by music director Patrick Summers) as a present frame for a past narrative. In movie terms, this opening dissolves into an extended flashback. Yet within that completely effective and non-intrusive storytelling trick, Slater intrudes again. And again. And again. Unsatisfied with flashing back, or even giving Violetta a lookalike ghost to haunt her with approaching death and the occasional camelia, this director from time to time paints the flashback as being driven half-mad by the woman’s fevers. Her ever-celebrating friends, in this production, slink and slither around ballrooms in ways that are interesting as choreography but not helpful, and even Alfredo himself gets caught up in some kind of hallucination later on, a fantasy about matadors and bulls. At least Slater got the second part right. By the time Violetta is due to collapse and die, she walks instead across the open room and disappears “into the light.” New Age coolness, to be sure. Yet in the process – and really, this is what’s wrong with Slater’s device – it steals precisely what we in the audience need to see and need to feel. 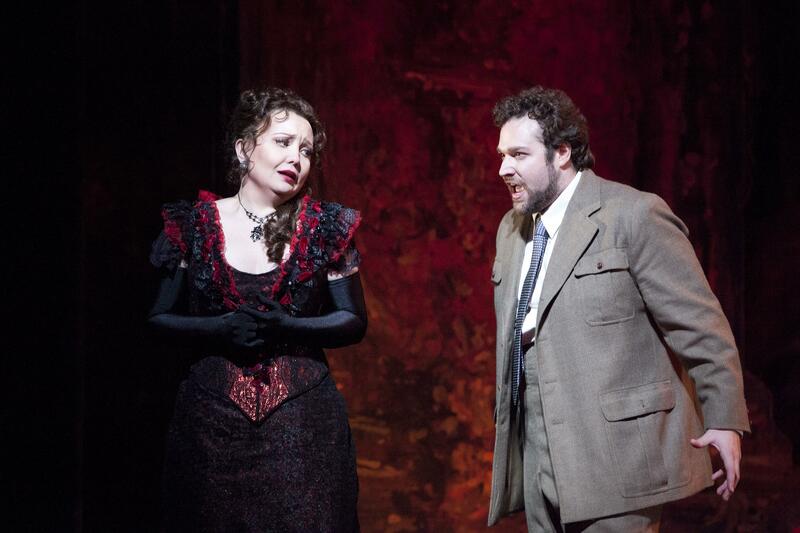 Any production of La Traviata, even one that turns its soprano into a star, needs to end with a lover weeping over the beloved body in his arms, not with just another guy sitting alone on a couch. Photos by Felix Sanchez: (top) Shagimuratova and Hymel; (bottom) Shagimuratova and friends. To say something is “like an opera” is another way of saying it resembles the cruel and often deadly succession of English kings and queens through a period that lasted, well, a very long time. After all, even here in Texas, we don’t typically have our exes beheaded. Unfortunately, Anna set in England is mostly an old-fashioned opera, lacking even the weird fascination of the same composer’s Lucia di Lammermoor set in Scotland, with its heroine’s justly famous mad scene. In case you’re wondering, you know an opera is “old-fashioned” when the surtitles showing the lyrics in English either stay the same or, as though out of embarrassment, disappear from the screen altogether. This means the singer is repeating the same words over and over, mostly to show off a host of the composer’s trills and tricks. This habit had largely disappeared from opera by the era of Puccini and the verismo composers who came after him. Any four-year-old with a crayon could trim 30-40 minutes out of this three-and-a-half-hour running time with nobody in the audience being the wiser. On the other hand, and it’s a big one, this is Donizetti we’re talking about – one of the most tirelessly pleasing and surprising composers to ever come out of Italy. Every time you’re about to throw in the opera-tolerance towel, you realize that some of the most beautiful music with some of the most haunting harmonies you’ve ever heard is slipping through the cracks. You listen suddenly, listen and are amazed. 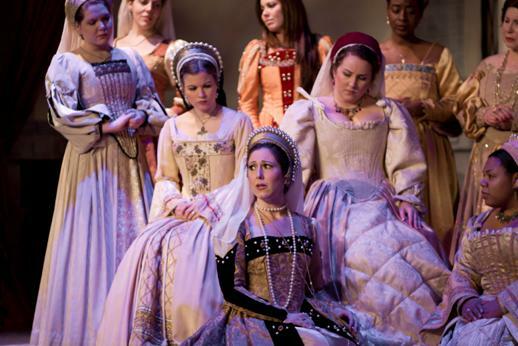 There are too many of them and they go on too long, but the solos and duets in Anna Bolena are terrific. And even they are outdone by the series of quartets, quintets and sextets in which characters sing their souls simultaneously with music that stops your heart. While still-new Opera in the Heights artistic director Enrique Carreon-Robledo has plenty to work with here, and he does, wonderful stage director Brian Byrnes has to make the most of what he’s given. Sure, the history is big and bold, but the opera itself is frustratingly static, without a lot of clear or passionate steering currents. Let’s just say that at no point in the opera could I think of a better way to stage a scene than the way Byrnes did it, even if I might wish the scene itself had gone away. Byrnes’ efforts got solid support from scenic designer Rachel Smith, costume designer Dena Scheh and lighting designer Kevin Taylor. With Opera in the Heights’ tradition of double-casting some leads, not one but two “local girls” get to shine in the role of Anna. Camille Zamora from Houston, a wonderful and expressive singer who’s even more beloved for her annual Sing for Hope fundraisers, makes the Emerald-Cast Anna seem as believable as she can – though the unsympathetic victim’s role the libretto gives her seems at odds with history’s conniving and manipulative Boleyn. It’s a good bet that Emily Newton from Lake Jackson will enjoy similar success with the Ruby Cast. Eric Kroncke is an imposing Henry VII in all performances, his basso edging toward profundo – or maybe that’s just in the monarch’s job description. Also memorable in the Emerald are Sandra Schwarzhaupt as Jane (here, Giovanna!) 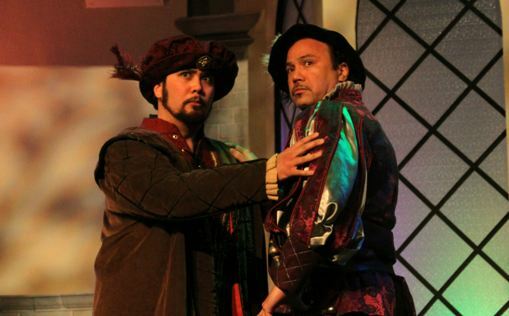 Seymour and tenor Lazaro Calderon as Anna’s probably-lover Lord “Riccardo” Percy. Bass Daymon Passmore is something of an Oh! Regular, and in both casts he is super as Lord Rochefort. His duets with tenor Calderon on opening night were true highlights. Top photo by Shannon Langman: Zamora and her ladies. Bottom photo by AlysonToups: Passmore and Calderon. 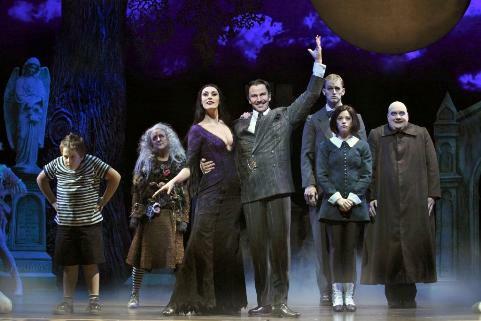 Surely, those who watched the cheeky old Addams Family TV series, which aired in appropriate black and white from 1964 to 1966, never imagined it would someday be a big-bucks Broadway musical. Then again, the same can be said about those who read that newspaper comic strip during the Depression – you know, the one about the spunky redheaded girl and her dog. And Annie seems to have done okay as a musical too. The point here is not that anything can be turned into a Broadway show with enough money, though the worst offenders (like Disney) would have you thinking so. The point is that once you reach a certain age, an updated, slightly more cynical and hip version of what you used to laugh at seems one of the best tickets you could ever buy. Thus, we have a New York-savvy version of the Charles Addams-inspired yarn heading out on tour through what New Yorkers see as the provinces, and no doubt packing ‘em in at each stop. 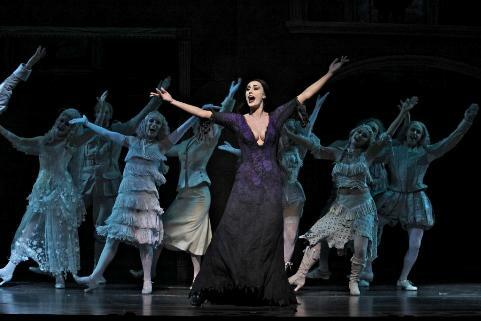 The musical on display at the Hobby Center offers many bits and pieces from various TV episodes, plus a few borrows from the series of terrific films starring Raul Julia as Gomez and Anjelica Huston as Morticia. Add those lustrous names to John Astin and Caroline Jones from the small screen, and the two stars now singing and dancing in Houston have quite a legacy to contend with. And, of course, to milk for all its worth. Handling the Gomez role launched on Broadway by Nathan Lane, Douglas Sills shines a bit more brightly than his counterpart, Sara Gettelfinger – though her cleavage is more daring than any displayed by either the TV (of course) or movie Morticias. In fact, part of the show’s suspense, for many, must involve the concept of wardrobe malfunction. As the romantic Latin lover, Sills is clearly drinking the Kool-Aid left by both Astin and Juilia: he is wild-eyed and lustful at all times (seldom in entertainment history has so much lust been directed by a man toward his wife! ), plus he wears the same kooky grin whenever the couple turns “normal” expectation on its ear – a big part of the fun. In Addamsville, all things dark, painful and feared, starting with death itself, become glorious, welcome and even longed-for. Many a laugh comes from this playful inversion, while Sills shines in his otherwise not-very-interesting songs and especially in the tango-meets-bolero-meets-flamenco number he gets with Morticia near the show’s end. Broadway veteran Martin Vidnovic is always great to watch, even as the boring, grouchy, judgmental husband to Crista Moore’s flaky, ever-rhyming wife, both from someplace called Ohio. See what I mean about a “New York-savvy” show? When they turn up at the creepy Addams mansion in Central Park to meet the parents of the girl their son likes, the confrontation of lifestyles is worthy of The Rocky Horror Picture Show, in which the Eisenhower era drops in on the transvestite ‘80s. Brian Justin Crum does what he can with their son Lucas, while Cortney Wolfson turns Addams daughter Wednesday into an impressive, torch-singing Broadway belter. Who’d have thunk it? Pippa Pearthree is fine as Grandma, as is young Patrick D. Kennedy as Wednesday’s torture-loving brother Pugsley – a chubby stand-in for all other boys tortured in one sense or another by their older sisters. And Tom Corbeil as Lurch contributes a properly hulking presence and a stirringly operatic bass voice. Though he has big shoes to fill after manic Christopher Lloyd in the movies, Blake Hammond gives us a funny, lovably insane Uncle Fester. He also makes the most of some bigtime schtick inspired by his love of the moon, spinning off quick, get-it-if-you-can references to Debussy’s most famous harmonies and Ralph Cramden’s signature line from The Honeymooners. To watch any play by Anton Chekhov, written as they were at the turn of the 20th century, is in some ways to witness the turn of the 21st. Not only was Theater of the Absurd, coming into its own a half-century later after the globe’s nuclear trauma, foreshadowed in these quirky characters’ endless non-connecting conversations, often about nonconnecting. So are, arguably, the tireless self-absorption, non-commenting “comments” and non-replying “replies” of Facebook and Twitter. Therefore, when we see one Chekhov character barely emerge from a long soliloquy about his or her broken dreams, only to have another step forward and announce to no one, “I am so very happy right now,” we of the 21st century should feel at home. 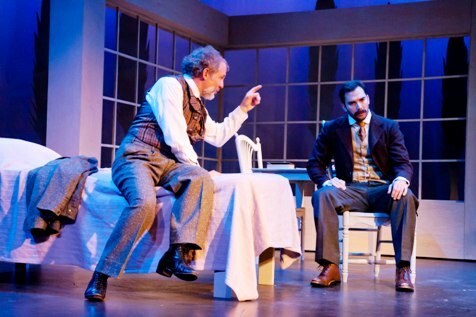 These are thoughts that come to mind – that are, in fact, unavoidable – watching the Classical Theatre Company’s first-rate production of Chekhov’s Uncle Vanya, directed with spirit and sensitivity by John Houchin. I initially wished Classical had taken on a different Chekhov work: The Seagull perhaps, or my personal favorite, The Cherry Orchard. Yet all such quibbling faded as we were dragged into the lives of characters of diverse ages and birthrights, all stuck together for a vaguely defined period of time in what seems a truly boring Russian country estate. There is, apparently, work that keeps the old place going, yet in true Chekhovian terms we don’t see anybody actually doing anything. In Chekhov’s onstage world, there’s apparently some kind of government stipend just for talking. And then talking some more. The basic premise of Uncle Vanya was probably used before, and certainly has been used since in theater, movies and television. The owner of this estate – a retired academic who’s written books described as derivative, meaningless and, of course, boring – is thinking of selling the place for cash, thus potentially displacing the unmarried daughter he has from his late first wife and that first wife’s unmarried brother, known around the house as Uncle Vanya. For his part, the old professor has a gorgeous young wife, whose desirability is obvious to all male characters onstage. Beyond that, what is there? Yet in Chekhov, beyond that, what do you need? As perfectly acted by the ensemble cast led by veteran Philip Lehl, characters careen into and off of each other through scene after scene, emoting, pronouncing and longing – heavy on the longing. There is, as in Shakespeare, utter chaos for most of the play, followed by a certain order and an uneasy peace. The writing is lovely as ever, filled with striking allusions and intensely observed details. As has often been said, Chekhov’s “other job” as a physician armed him well for the clinical nature of his best writing. Clinical, but with a big heart. Lehl is magnificent as the title character, lamenting all he’s given up now that he’s old (he’s 47! ), but not averse to taking a last stab at happiness with the Professor’s young wife, a role in which Tracie Thomason proves his delicious foil. The woman’s morals stand between her and a fling with Vanya, but not so much between her and a fantasy with a young “radical” doctor who ignores other patients to spend more and more time around the house. David Matranga is the perfect Chekhovian here, making huge pronouncements about life, love and forests (a recurring, intriguing metaphor) but then invariably undercutting himself with something like “but maybe not” or “perhaps I’m simply insane.” Chekhov’s characters step willingly into any spotlight that will hold them, but they’re never comfortable there for long. Eva Laporte delivers a sterling performance as Sonya, the unmarried daughter who for years has loved this doctor from a distance, while Carl Masterson brings ample sputtering and dithering to the role of the senile, gout-ridden Professor with the young wife and the country estate he’s hoping to unload. Yes, hilarity ensues. It really does. Yet thanks to the master’s touch, it’s a kind of hilarity that’s never far from life’s disappointments, resentments and numberless dead ends. Uncle Vanya, Thursday-Sunday through Jan. 22. TBH Center, 333 S. Jensen. www.classicaltheatre.org. Photos by Jan Saenz: (top) Philip Lehl and David Matranga, (bottom) Tracie Thomason and Eva Laporte.